That picture above is an actual photograph of TERMINATOR 2: JUDGMENT DAY 3D playing on a theater screen. Thanks to Crystal for taking this great picture! 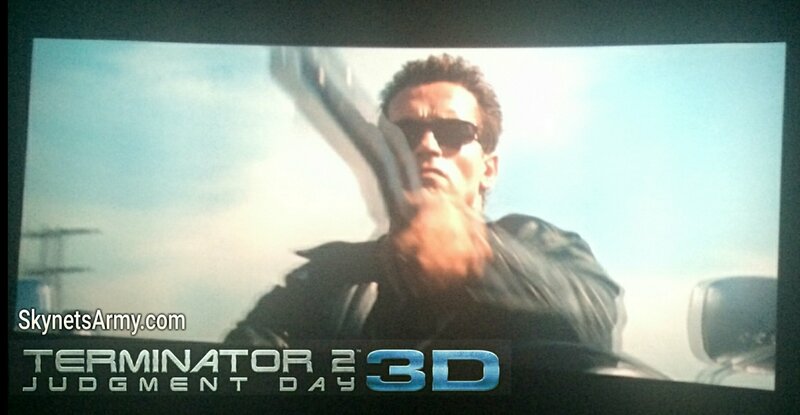 And now, finally for most of the world, you too can go see T2 in 3D TODAY. So go… now… to your closest screening and see the best science fiction sequel of all time in the theater as much as you can. Go twice! Go three times! Let those studio heads know that Terminator is still a viable franchise as much as it’s ever been! Previous PostJames Cameron reminisces changing the ending of “Terminator 2: Judgment Day”.Next PostDirector Alan Taylor recalls “rough” experience with TERMINATOR GENISYS. I am seeing it tonight !